Welcome! I’m Tanis! This website is brought to you by me , but with A LOT of help and support from my hunk-of-burning-love-Davis and my lovely yet partially crazy daughter Ceedrus. If you want to hear someone else’s opinion of me visit Simple Life, Abundant Living. Dan wrote an incredibly complimentary article on me me ME (*sing-song voice) called Crabs Ahoy! I should add that I have never met Dan before in my whole entire life! 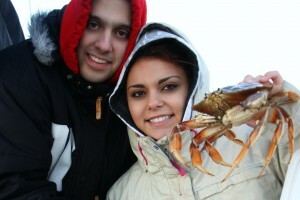 This website was made to give you maximum crabbing pleasure and suit all your crabbing needs whatever they may be. If you came here to learn how to catch crabs and then kill them, you’ve come to the right place. 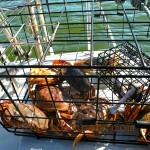 Here on these pages you will find all the essential ingredients needed to become a successful crab fisherman. Fisherwoman. Fisherperson. Crabber. Whatever. Maybe you’re not interested in crab fishing but would like to know how to prepare an outstanding meal with crab meat as the main feature. We have lots of recipes for that! Perhaps you just purchased a live crab or two and want to know what to do with them. On this site we’ll teach you how to cook them, clean them and eat the heck out of them! 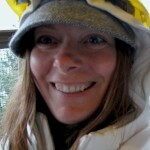 I hope you enjoy our website, learn some things and come back often. I’ve been crabbing and fishing for as long as I can remember. I’d like to consider myself a perfect tomboy who can dissect my crabs faster than any male I know. As a child, I used to pick mussels off of a post and use them on a fishing hook to catch bull head so that we’d have bait for our crab traps. When other kids went to the pool to swim every summer, I was soaking wet in ocean water from pulling in our traps. That is, in my spare time. Most other times I spent on my Dad’s boat trolling for salmon, dropping crab traps, then heading to the beach to dig for clams. Our dinner plates were always filled with booty from the sea. My Mom is a fabulous cook (she has since learned to cook crab) and REALLY enjoys herself in the kitchen. It’s a Scottish thing, I think. 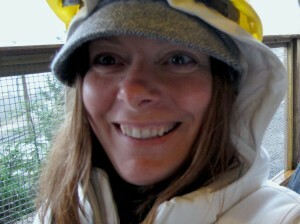 I got my fine cooking skills along with my recipes and ability to mix and mingle different ingredients all from my mom. Crabs don’t make good house pets. Trust me, I’ve tried. Always approach a feisty crab from behind, unless you prefer to high four rather than high five. This is the part in my story where I started to cook my own crabs alive. I was able to cook a delicious meal long before I was allowed to mow down the fur on my legs and harvest the oil from my T-zone (ie. quite young). My ability to turn a hard-shelled creature into a mouth watering meal is rivaled only by my inability to measure any ingredient properly; most of my recipes should be loosely followed rather than strictly adhered to. Precise measurements are for losers. Crabaca likes crabs and Tanis and the crabs she cooks. Best crabby web site I have ever seen! 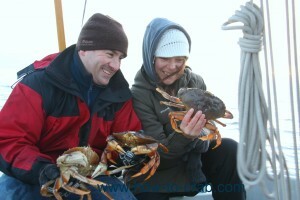 Have you checked out this page http://how-to-crab.com/where-to-catch-crabs/ yet? It should give you all the information you need to get you started. Don’t forget to buy a fishing licence at any Canadian tire.